View of Port Penryn in Gwynned, North Wales. Port Penryn, in situated on the North Eastern banks of the Menai Straits and it was from here that slate was exported from Wales in the 18th and 19th centuries. 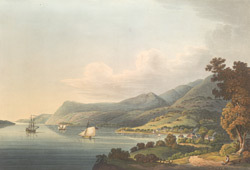 The development of the area was due to the transformation of the original port Aber Cegin and the building of a road from the large inland slate quarries to the coast by industrialist Richard Pennant. The port was also linked to the quarries at Bethesda by a narrow gauge railway.